If you stray off the beaten path, you might encounter a wall of Hobble-bush (viburnum lantanoides). Where the branches touch the ground, they send down roots and grow new stems. 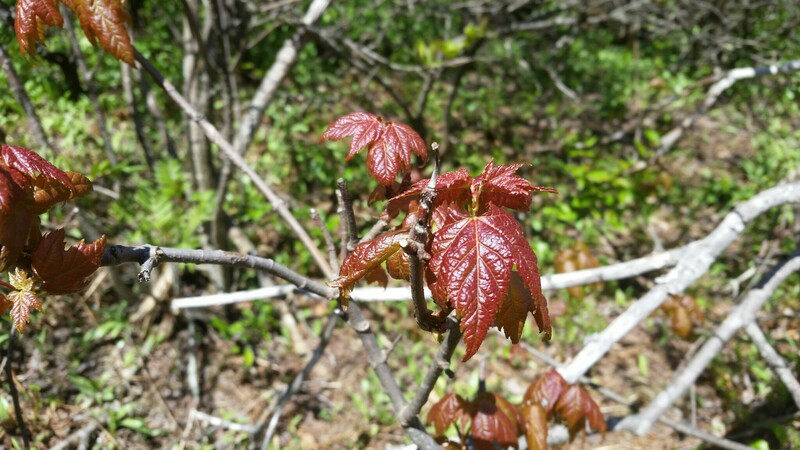 Soon there is a thicket eager to hobble the unwary hiker — hence the plant’s popular name. 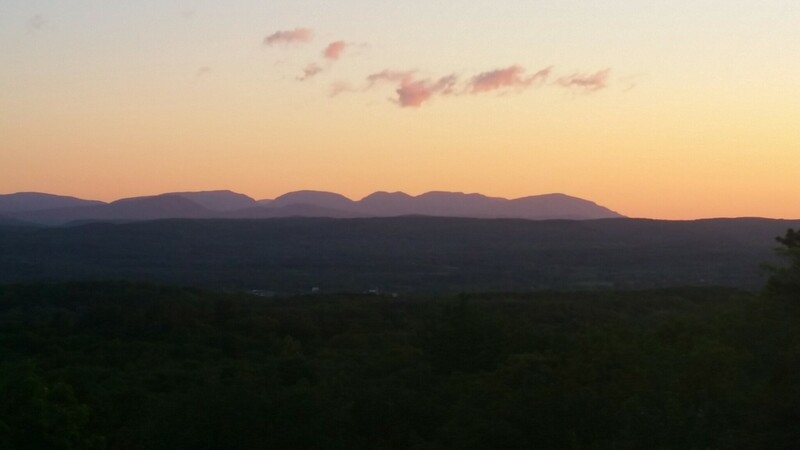 On a recent morning in late May, I drove out to the Catskills to run and hike on the rocky trails, with the special goal of climbing five peaks which have no paths. It was a clear and unseasonably cool morning, and en route to the trailhead, the mountain walls were back-lit in the morning twilight. I pulled into the trailhead at 7:30 AM and proceeded to hike about three miles north along the road, looking for the best place to enter the woods for the bushwhack up to the summit of Fir Mountain, the morning’s first objective. 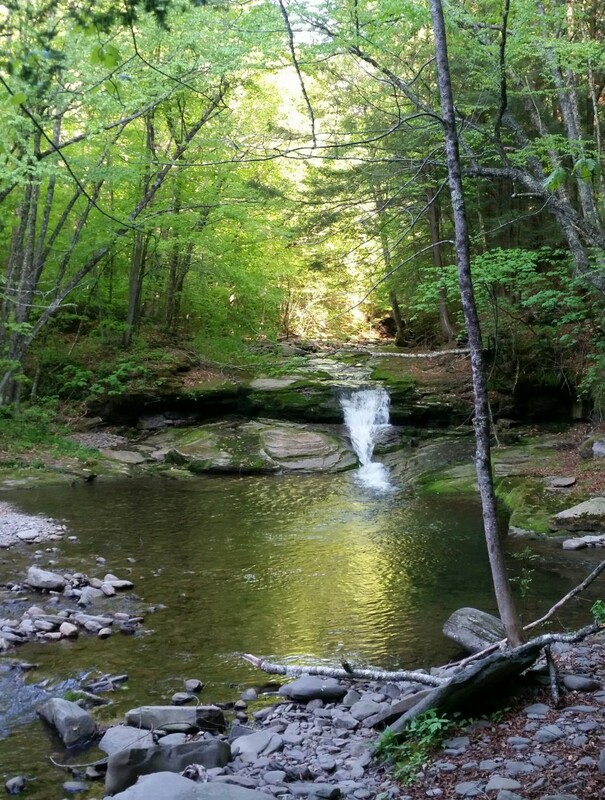 An unmarked footpath caught my eye; it led me down to a glade in the forest where the headwaters of the Esopus creek spilled over sandstone slabs and pooled in a small basin. And then it was off to Big Indian, the morning’s second objective, following the ridge first north, then turning west. And here I began to notice the Hobble-bush. 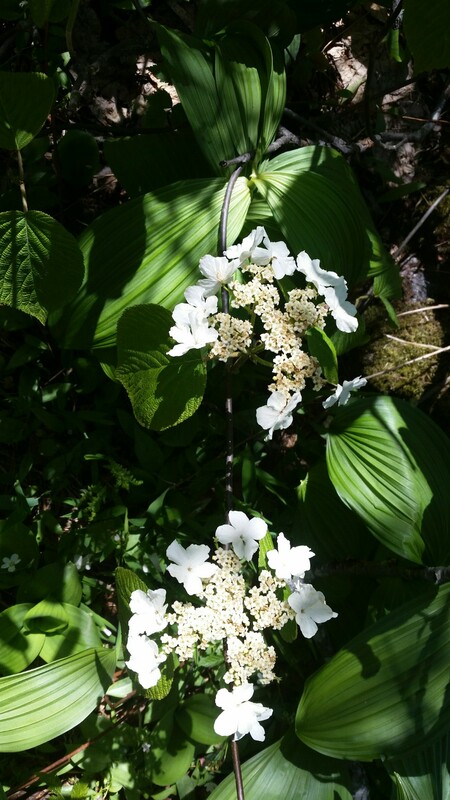 I had seen its heart-shaped, prominently-veined leaves thousands of times before without ever pausing to study the plant, but now, in late May, the branches were festooned with bright white flowers you couldn’t ignore. Upon reaching the summit of Big Indian, I encountered two hikers, the first people I had seen all morning. We chatted for a couple of minutes then wished each other safe travels and went our separate ways. 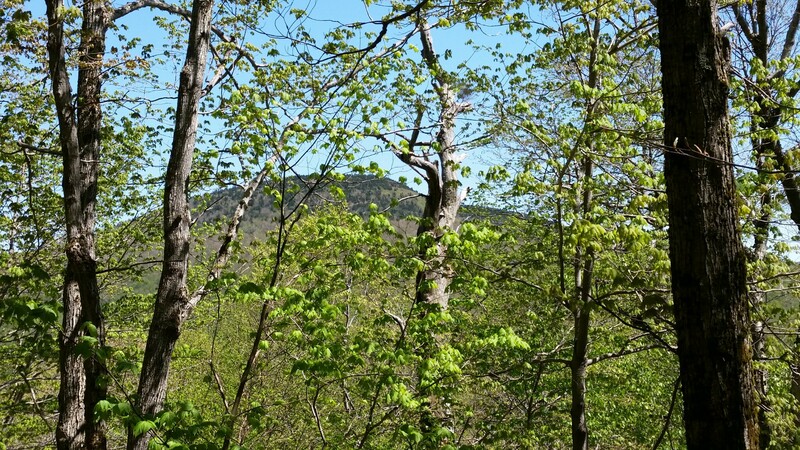 An unmarked footpath took me down to the blue-blazed Pine Hill trail, and one half mile later, I turned back into the woods, following a broad ridge toward the peak of Doubletop Mountain, the day’s third bushwhacking objective. The ground was covered in a mix of Hobble-bush and young beech trees. Despite its name, the Hobble-bush didn’t trip me up; I found it relatively easy to slide through the waist-high stems. A bigger challenge was the beech trees, whose stout branches grew horizontally at chest and face height. These yield unwillingly; one has to wrestle them out of the way or veer off and circumnavigate. Worst of all are fallen trees, especially when several have collapsed on the ground in a great tangle with jagged branches sticking out in all directions. Bushwhacking is mentally demanding! You must continuously scan the terrain for the most direct route through a maze of vegetation and rock outcroppings, with the goal of avoiding obstacles before you are snared in them. As you move slowly forward, hands deflect branches, while feet feel their way forward, testing each step before committing. It’s feels somewhat like putting together a giant jigsaw puzzle. 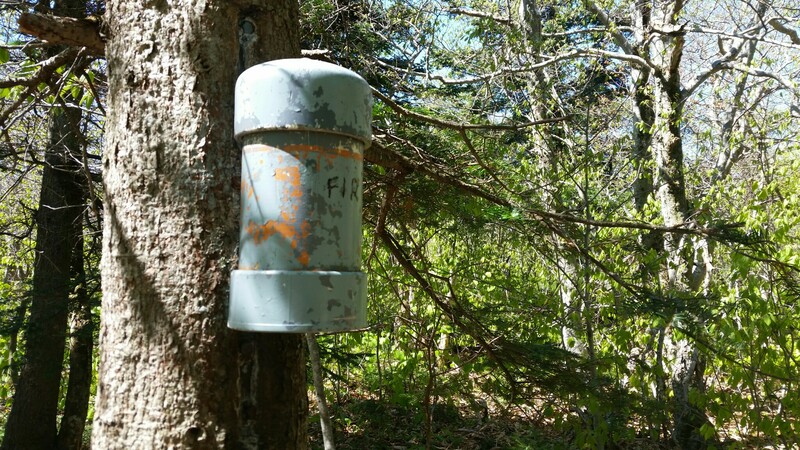 For a runner — used to rapid pace and steady rhythm — bushwhacking can be frustrating and downright disheartening, especially when a glance at your watch shows you’re moving only one mile per hour. Time moved slowly but eventually I reached Doubletop and found another canister. Continuing west, I picked my way down a steep, 1000-foot embankment, stepping around and scooting down sandstone ledges and piles of loose rock. Through a break in the beech forest, I could just make out Graham Mountain, about a mile to the front. 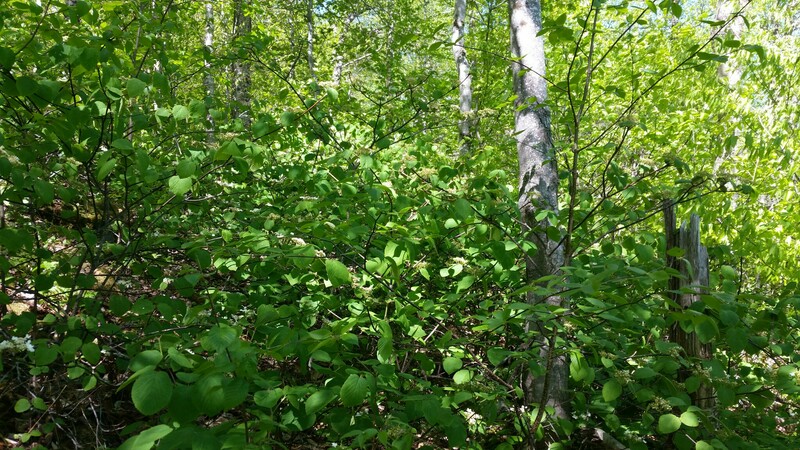 It’s hard to see your feet when bushwhacking, not only because the grass and brush hide them, but also because you dare not take your eyes off the branches reaching for your face, lest they catch and scratch you. But take a careless step at your peril! That rock might be a stable platform — or it might tilt and catapult you to the side — or it might slip down a muddy slope and trigger an avalanche. The ground might be solid — or it might consist of nothing more substantial than moss and dried leaves covering a pile of loose rocks. Your foot could plunge through, lacerating skin, twisting ankle, wrenching knee. With any misstep, you must be ready to react: before committing weight to the front foot, the back foot must have a contingency plan for how it will restore the body’s balance should it be called upon to do so. Mindful of the risks, I clambered down the rest of the slope slowly and carefully, eventually reached the saddle between the two mountains, and squelched through a muddy spot before heading up to the summit of Graham. 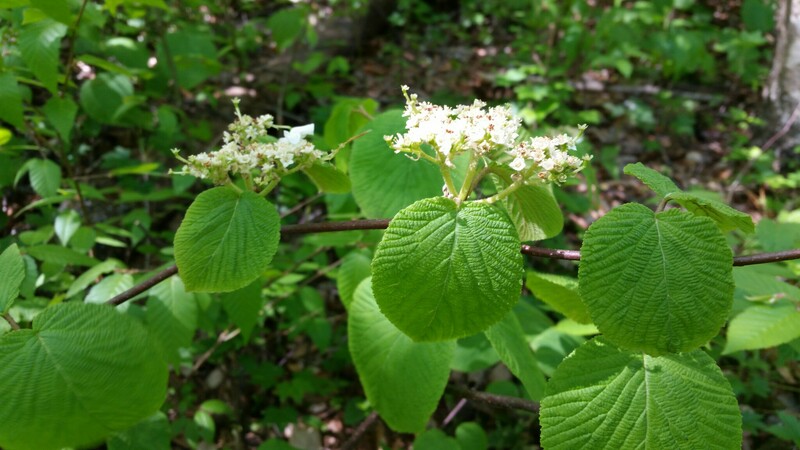 I admired the pretty white flowers on more Hobble-bush, as well as the fresh young leaves of beech, maple, and cherry trees which had just unfolded from the buds. Up here at almost 3,900 feet, the sun was bright, but the air was cool. 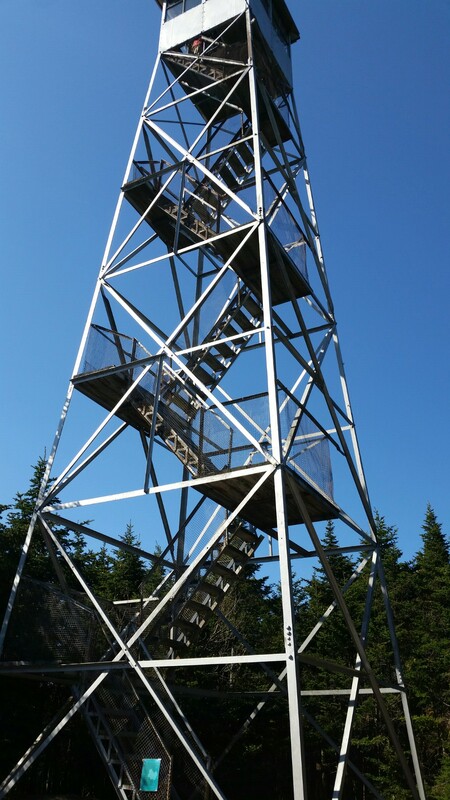 From Graham, I could spot my next objective, the fire tower on Balsam Lake, which stood needle-like above the forest. Mercifully, a trail led me there. I had had enough bushwhacking. It was late afternoon, and I took the day’s first break beneath the fire tower. Twenty minutes elapsed while I ate some pemmican, hooked up battery chargers to watch and phone, and emptied debris out of shoes and socks. Then it was time to head down to the valley floor on an overgrown logging road which was covered in stinging nettles. 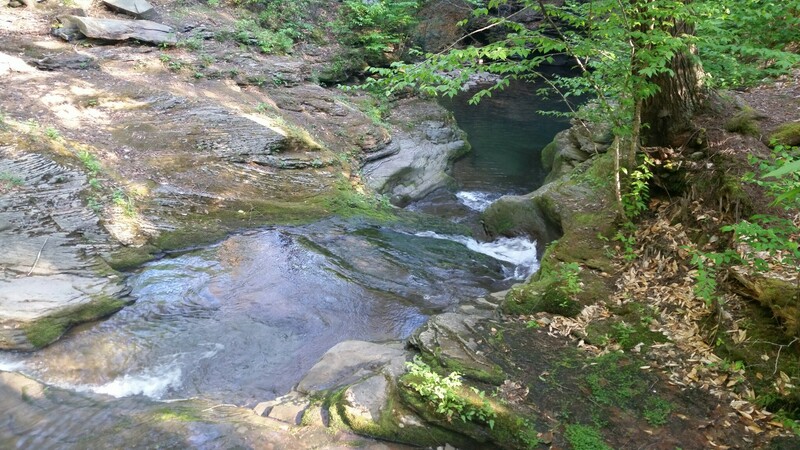 The trail now took me east, past a waterfall and quiet pool in the Shandaken Creek, before ascending back onto the ridge. 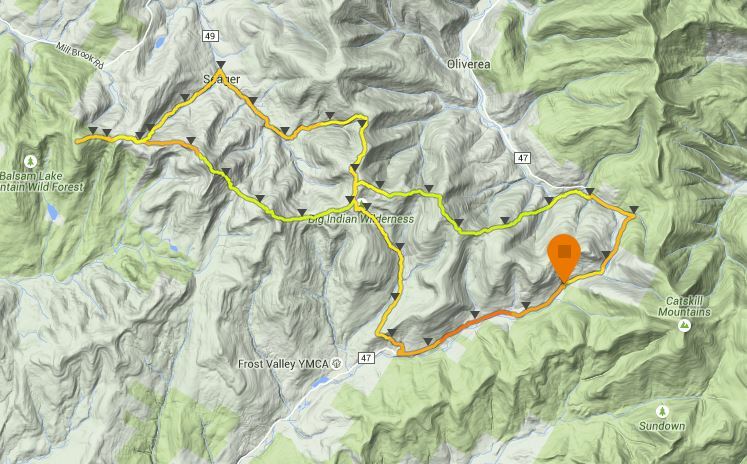 I worked to maintain a steady pace up and over the mountain. Thankfully I was done with the bushwhacking, but even a good trail in the Catskills is steep and rocky, and a quick glance at the map showed almost twelve miles to go to reach the car. My journey had taken longer than expected: it was now early evening, and I was going to miss dinner with my wife and son. Besides the two hikers on Big Indian and a handful of people at Balsam Lake, I hadn’t encountered a soul all day. The Hobble-bush was no longer interesting — I longed for company. And then, to my surprise, here were the two hikers from Big Indian. They were startled to hear I had climbed five peaks in the time it had taken them to climb one and that I was finishing up more than thirty miles of bushwhacking and rough trails in a single day. Then they were gone. The sun was setting, the light was streaming in horizontally, and the shadows were lengthening. 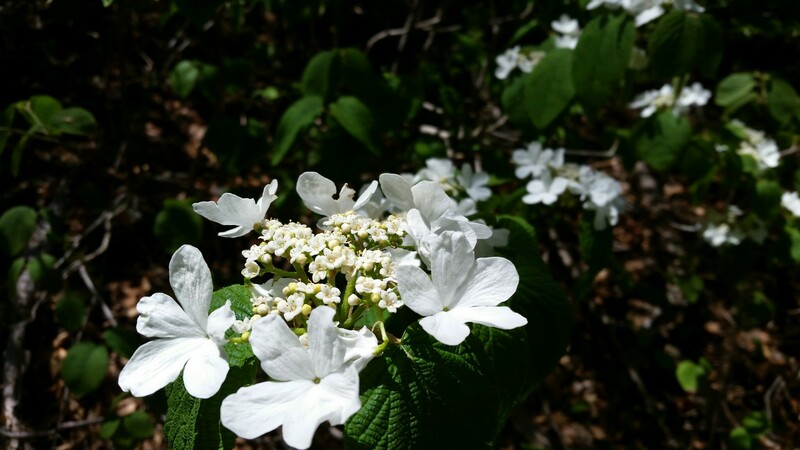 To the side of the trail was a large thicket of Hobble-bush, flowers floating like a flotilla of small white boats in a sea of green. I was anxious to get back to the car and then family and home. The miles passed slowly. Soon it was dark, and I flicked on a light. An owl hooted nearby. For a moment, my mind was empty, and I floated effortlessly along the trail. The owl hooted once more, and I felt that I could travel through the forest indefinitely. Then the feeling passed. I looked at my watch, anxious to be home, and picked up the pace.